You are probably already aware of the fact that visual content is a must for any content marketing strategy, regardless of the industry you are in. 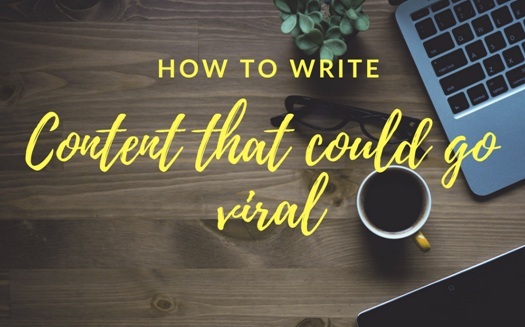 While text-based content is always going to be an integral part of any campaign, you need to also introduce visuals to your content to really set yourself apart from the crowd in this digital era. You need to know exactly what will stimulate growth and engagement on your blog posts and what will not before you embark onto a content marketing campaign. It’s all about striking the right balance between text and visuals. People enjoy visually stimulating content. Visual content has a huge impact on its viewers- it provokes emotion and is better remembered. Presentations with visual aides are 43% more persuasive since 65% of people are visual learners. Now that is a huge number. 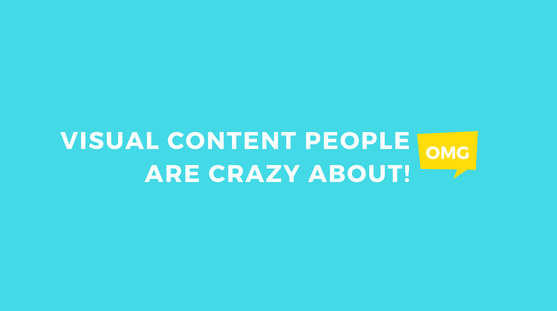 So let us dive deeper into the types of visual content that people are crazy about! Got a lot of statistical data? Want to breakdown ‘hard-to-understand’ content into a more easily viewable format? Info graphics is what you need then. Infographics are the epitome of visual content. They accommodate a lot of information into one compact, easily viewable visual. What is great about them is that they cut short on lengthy, intimidating content that could get rather boring to readers. Infographics are super easy to comprehend and are visually appealing at the same time. In fact, infographics are liked and shared 3 times more than any other content in the social media realm. To reap of all the rewards of infographics, it is imperative that design and layout be as impactful as possible. This calls for selecting the right font, colors and shapes to convey your data. Info graphics have the potential to bring to life even the most seemingly mundane statistics. Believe it or not memes are the next big thing in the content marketing space. 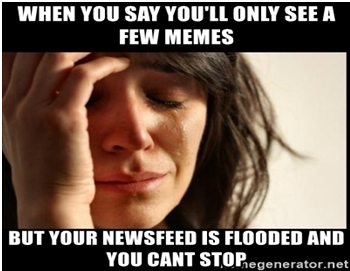 Memes are the new black! It’s impossible to not notice them since we are flooded with them on the internet. For people who are still not acquainted with them, they are images that transport a message that may be humorous, quirky or sad. What makes them even more popular is the fact that they often carry messages that are relatable to its viewers but put together in a manner that tickles your funny bones. Believe us, they are addictive! We are flooded with memes on social media. Facebook, Instagram, Whatsapp, Twitter- you name it. Memes are EVERYWHERE. Creating your own memes is a great way to communicate your message with a tinge of fun to it. However, you must first determine if memes are appropriate for your niche or whether or not they will encourage engagement. Memes allow you to create inside jokes about your industry, which is a great way to make people laugh and build a community around your brand. Videos are not only the most popular visual content format but are also proven to be one of the most effective link building tools. A study by SEOmoz suggested that posts with videos on it had 3 times more links as compared to those without it. This indicates that videos not only captivate audiences but also create share worthy content. Videos tell us a story. They make for incredible visual content especially when you are trying to present common problems and then introduce a solution your product may offer. There are numerous types of videos- you could consider how-to videos, demonstrations, animated explainer videos or even customer testimonials. Whichever type of video you choose to create, note that it is imperative that the video is in congruence with the overall style, voice and ethos of your brand. Images are extremely important for several good reasons. For instance, they help audience put a face to the brand. Besides, splitting up a body of text with images fetches you brownie points. 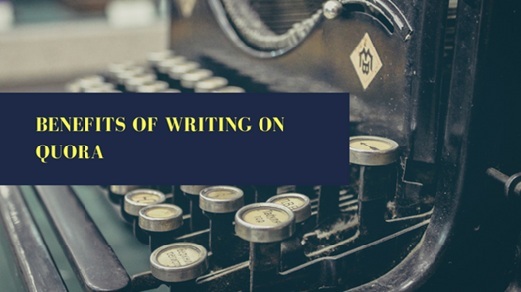 This retains your reader’s attention and they are more inclined to finishing what you have written (provided the images are contextually relevant). It is always a good idea to use original images produced by you. This adds a much desired personal touch to your content. Whatever image you produce, always make sure they resonate with your brand or display the USPs of your product. Use visual content to your advantage! The visceral psyche of your audience is tapped by visual content. This encourages your audiences to discover more about your brand. Generating high quality visual content that truly resonates with people is a sure way to promote your brand. Visual content is your go-to weapon to increase the awareness of your brand.